SanDisk was the top contributor followed by Sony on the second spot. 32GB capacity segment witnessed 30% growth in terms of unit shipments. Flash Drives recorded 24% growth as compared to the previous quarter. SanDisk’s Cruzer Blade was the most popular pen drive model. 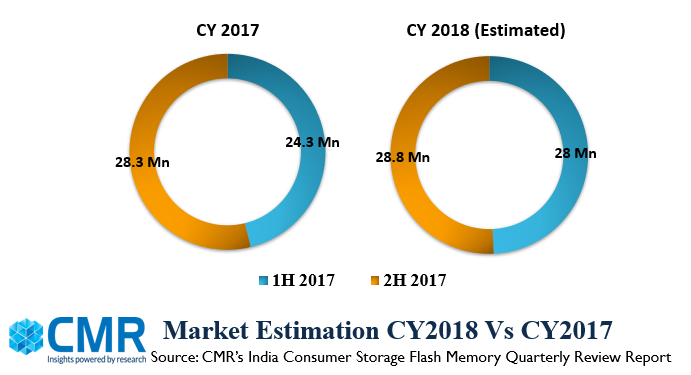 Gurugram/New Delhi, December 26, 2018 : The India Consumer Storage Flash Memory Market witnessed 12% growth in 3Q CY2018 when compared to 2Q CY2018, according to CMR’s India Consumer Storage Flash Memory Market Review for November 2018. “As expected, the festive season played a major role in the overall market growth. Flash Drive category was the key contributor to the same. Price variation also proved to be one of the growth drivers. Sales were enhanced as prices of almost all the products were slashed from mid till the end of the quarter” observed Shipra Sinha, Lead Analyst, CyberMedia Research. In the overall India Consumer Storage Flash Memory market, SanDisk continued its dominance and contributed 58% of the market share in terms of units shipped. Sony replaced Strontium to be at the second spot. Sony has evolved as one of the major vendors in the India consumer storage market due to its strategy involving India manufacturing, and a strong product pipeline especially in the flash drive category. The overall market saw a significant movement towards higher capacities like 32 GB and 64 GB. 32 GB witnessed 30% growth as compared to 2Q CY2018. However, the 16 GB segment maintained its number one position in the overall consumer storage market in terms of unit shipments. 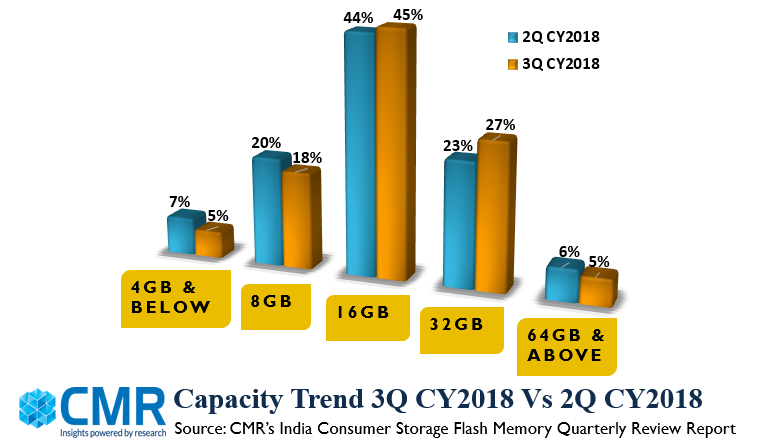 According to Shipra, “Consumers’ inclination towards huge storage capacity, low priced smartphones has affected Micro SD growth for quite some time now. However, with the exponential growth in the digital world, social networking, entertainment and gaming apps etc., MicroSD cards will play a major role in supporting with that extra storage. Also, the forthcoming marriage season in 4Q CY2018 will help in uplifting the SD cards and Pen drive sales,” “The overall market will continue to shift towards higher capacities due to marginal price difference among different capacity drives” added Shipra.